Bacteria thrives when blood sugar levels are high, making it easier for cavity-causing plaque to build up on the surface of the teeth. What’s more, diabetes can cause inhibition of salivary glands. Saliva is necessary to keep the inside of the mouth moist and to wash away plaque. Less saliva means that plaque has a greater chance of sticking around. This combination of elevated blood sugar levels and decreased saliva levels creates a perfect storm for tooth decay. In addition, the relationship between infections and high blood sugar levels goes both ways. Infections can wreak havoc on blood sugar levels in diabetics, and high blood glucose levels make it easier to get infections in many places in the body, the mouth being no exception. Because of this, diabetics must be meticulous about oral care. Infections in the gums or other places in the mouth can spell trouble for more than just oral health, and the cyclical relationship between infection and blood glucose levels can create an endless spiral of complications to form. Diabetics often have delayed healing and are more prone to infections in the first place, so any problems that do arise can be that much more difficult to correct. This is why proper dental care is so important for them. They are already at an increased risk of developing periodontal disease, and if they do develop it, it can be detrimental to their overall health. 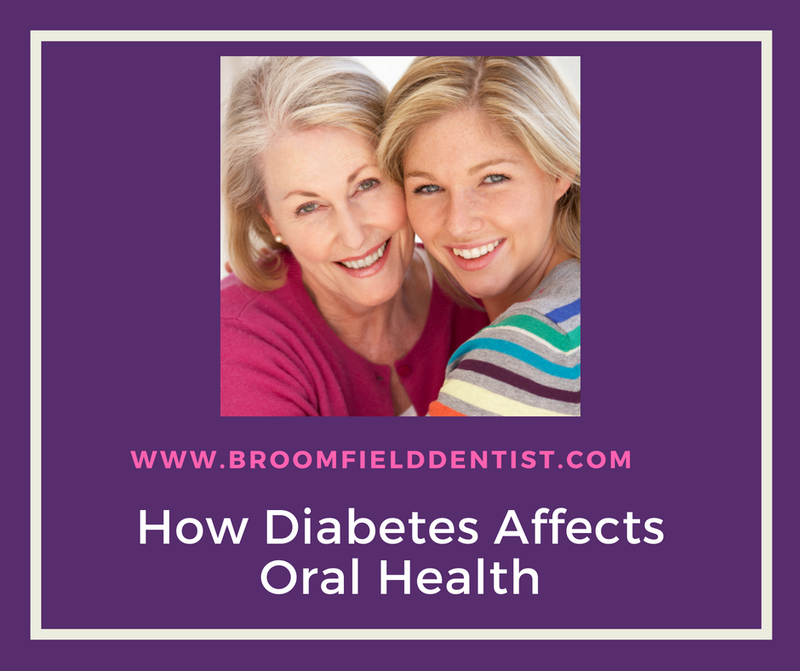 If you suffer from diabetes, it is critical to consistently manage blood sugar levels, keep regular dental appointments, and to be diligent about daily oral care. Dr. Mary Peebles-Turner provides excellent care for her dental patients in Broomfield, Colorado.